Vajdahunyad Castle Summer Music Festival 2019. 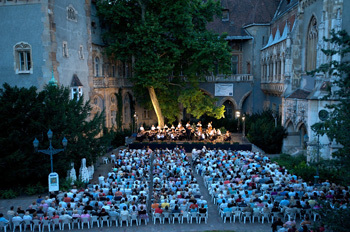 Enjoy classical melodies on summer evenings in 2019 at one of Budapest’s most romantic venues, the Vajdahunyad castle in City Park. The mock castle of Vajdahunyad in City Park hosts a series of classical music, klezmer, swing, and gypsy music concerts in the middle of summer. Tickets cost 3 500 – 5 500 HUF. Tickets: 3 500 HUF/12 EUR. Tchaikovsky: Serenade for Strings Op.48. With: singers: Juci Németh, Bori Rutkai, Frenk, Krisztián Szűcs, Misi Mező. Skilfully orchestrated Gypsy music – old film music and hits, music hall couplets and pop songs in a bar mood. Selection of numbers from the group’s CDs. J. Strauss: Éljen a magyar! See also the official website of the concert series. TIPS: The Organ Concert Series in St. Stephen Basilica or the Classical Concerts in Danube Palace are also excellent culturral entertainment in Budapest. Short concerts entertain everyone for free at a dozen Budapest venues all summer. The Evening Concerts in the Zoo & Botanical Garden on Wednesdays betweeen 06. July – 24. August are also excellent summer programs.